« Winner of Name That Ware November 2008! The ware for December 2008 is shown below. Click on the images for a much larger version. This ware — incredibly late due to CES and me having the flu for the past week — is from The Great Internet Migratory Box of Electronic Junk. I love the idea of TGIMBOEJ; I’ve just been terribly delinquent about doing my part, which is writing up something about it and then passing it on. I’m going to add some tasty fun parts to the box and send it on to the next victim…any volunteers? This entry was posted on Monday, January 19th, 2009 at 2:53 am and is filed under Hacking. You can follow any responses to this entry through the RSS 2.0 feed. Both comments and pings are currently closed. Hmm. “General purpose I/O board”. The design of the board looks to be late ’70s – early ’80s (MSI/LSI parts, no solder mask) but the date codes are 5-10 years later. We have three dual parallel ports (MC6821’s), a serial I/O chip (6850) and a 128×8 static RAM (6810) and a bit of glue for host interface. Plus a tunable 555 clock. It looks like the memory was expandable. These are all MC6800 family parts, though interestingly the main 6800 “personal” computer brands (SWTPC, Altair 680, The Digital Group) were all defunct by the time this was manufactured. There’s a slim possibility it could have been a disk controller but six parallel I/O ports seems like it would have been overkill. Wilder guess: 48 bits of PIO could have been used for controlling the pins on a high-speed dot-matrix line printer. My guess is an I/O expansion card for an old computer. 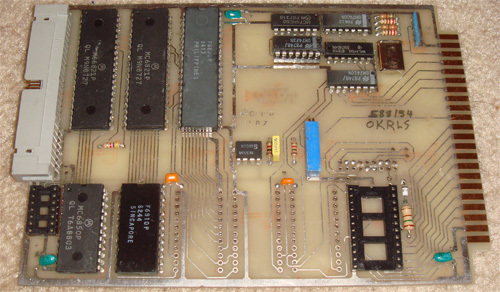 In my brief searching, it seems that the Commodore VIC-20, 64, 128, and the Apple I all used a 44-pin edge connector with ground on both ends, as shown by this board. The pinouts don’t quite match the VIC-20 or C64. It doesn’t match the Apple-1 44-pin connector either. Oh well. could it be wince control module? In case you’re still looking for a TGIMBOEJ recipient, I’d be quite interested, and I have lots of vintage goodies I’d like to add. controller card linked to by johnny. with the 87 on the PCB, so it is likely a late 80’s variant. ( 2 phases for 6800, with a J-K flip flop ) and chip select decoding. select or address decode jumpering for different size EPROMs. I think its a control card out of an old CRO or sample and hold device. The MC6821P is a peripheral interface adapter, F6810 is a 128k static RAM chip, and while I cant find a datasheet or info on it, and the MC6850 is a ACIA as mentioned above. Looking at the traces, we see PIA > ACIA, then possibly ACIA > RAM on solder side. would be nifty if I could find info on the 6800, but no joy on that one. Data comes in from front panel or other modules via the connector on the top, gets held and passed on for processing to a downstream component via the cardslot. I’m going with a sample hold card out of some old kit, maybe Tektronix/Baker Instruments/Fluke. The commenter above provided a link to a SBC Ad, which makes sense as you’d need individual sub processors for each function within a CRO or S&H. The missing ROM supports this was part of a larger system as it no doubt had a master ROM somewhere on the motherboard or on another card on the bus. Looks like bus2ide interface for 8-bit atari. ouch. the pin count for external device is 50. it may be scsi interface. If you’re still looking for your next victim, I’ll take it off of your hands. I have a few oddities I would like to add to it.